Express International Translations Inc - We Speak, Write and Smile in ALL Languages. Unilingual Anglophones in Canada often despair of their inability to speak French, but may not realize that a healthy portion of the words they commonly use in everyday parlance come from French. A text written in French would indeed be more intelligible to any hopelessly unilingual Anglophone than anything written in Old English. This heavy influx of French into the English has nothing to do with the bilingual nature English/French of Canada, but can be sourced to the conquest of England by the Normans in 1066 and to the ensuing Norman rule of the British Isles for nearly 200 years during which Normandy (that part of France where the Normans came from) and England were united under one ruler. French became the language of the administration, of the nobility and of the courts. In addition, French enjoys a healthy presence in everything that has to do with home furnishing, food, fashion and luxury (surprised?). So, what are the French words commonly used in English? Let us start with politics: govern, parliament, administer, court are all French words. Economy: money, finance, revenue, profit, benefit, property. While it will surprise nobody that English borrowed ample words from French for food, food deserves a paragraph by itself, for it denotes the social relationship that existed between the English peasantry (who spoke English) and the French cooks exercising their trade in high social circles. There is an interesting coupling of English and French words when talking about animals depending on whether the animal is on the field or ready to be consumed. So, the cow in the field becomes beef (French word) on our table. A pig becomes pork (French word), a calf becomes veal (French word) , sheep becomes mutton (French word). To finish off with food, let us note that meals, namely dinner and supper come from French as well as good things that may ornament your table such is biscuit, salad and fruit. 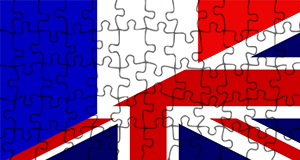 A further blog will be devoted to another kind of pairing in which English has borrowed not one, but two French words to express the same meaning. PS: Underlined words in this narrative are all French words. A sizeable proportion. This entry was posted in French Translations and tagged eitx, Express International Translations, French influence on English language, French terms in English on January 16, 2017 by Philippe Vitu. Translation softwares, such as Google Translate and Bing Translate are getting more and more sophisticated and can be great tools to help with everyday challenges you might encounter on your travels. 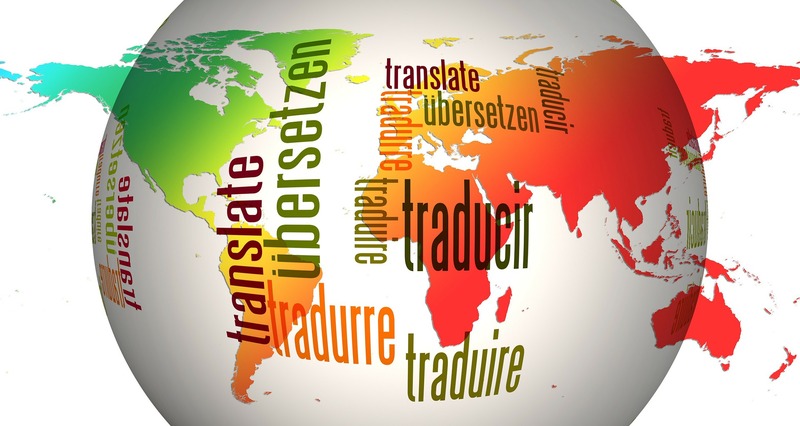 But are they sophisticated enough to perform high-profile translations for your company? Some very embarrassing examples we consistently see on social media suggest that the answer is “no.” Translation softwares are not feed by the works of professional translators but crowdsourced through the general public. This bears a high risk for inaccurate translations and often even violate cultural norms. One embarrassing example is Bing Translator’s mistranslation of the term word “Daesh” — the Arabic word for the Islamic State — that became “Saudi Arabia” in its English translation. This was seen by many as an insult to an entire nation. Google Translate also made the news for an embarrassing error just a few months prior. When translating from Ukrainian into Russian, the “Russian Federation” became “Mordor”, the well known mountain of the Lord of the Rings, which is, in reality, located in New Zealand. 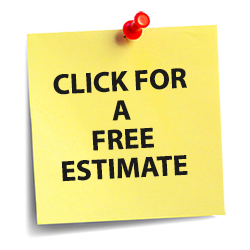 While these news make us laugh every once in a while, it is still alerting that occasionally we come across a business who uses translation softwares for the translation of their websites or marketing material. Not only do these incorrect translations look embarrassing for that organization, they can also insult its customers — which is the opposite of what these businesses set out to do. 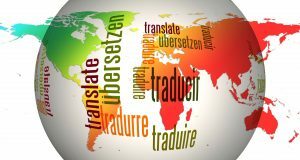 The use of translation softwares is great for ordering food abroad or communicating allergies to the chef, but it is certainly not advisable to use crowdsourced translation softwares for your website, technical documents, or marketing material. Or else you might end up being featured on social media, too, but not the way you wanted to be. This entry was posted in International Translations, Translation Service and tagged Bing Translate, Google Translate, translation softwares on October 27, 2016 by Philippe Vitu. Canada is not alone in facing a shortage of qualified court interpreters to help in the prosecution of crimes committed by ever-increasing slice of cosmopolitan miscreants. Let us look at the case of South Korea: The Chosun Ilbo is reporting that in 2014, the number of countries where more than 40 people were indicted in S. Korea came to an astounding 20. Canadians, Americans and Japanese among the largest group of suspects next to the Chinese, who constitute the largest group of people indicted. However, the countries of origin have diversified recently to include criminals from Mongolia, Nigeria, Russia, Sri Lanka, Pakistan, Uzbekistan and Thailand. Courts have trouble keeping up. The Chosun Ilbo reports that the recent trial of a Nigerian arrested for an online scam turned into a judicial marathon: although English is the official language, over 200 local languages are spoken in Nigeria and no suitable court interpreter was available. The same is true for trials of Pakistani persons: the range of languages is large and often, two interpreters are needed: one from the local language into the Urdu language and the other from Urdu into the Korean language. This entry was posted in Interpretation and tagged court interpreter, legal interpretation, legal translations on February 11, 2015 by Philippe Vitu. I spent a few years growing-up in France, where most of my family resides. Meeting one of my older female cousins who was a pharmacist, I referred to her as “la pharmacienne”. She corrected me immediately with some degree of authority in her voice: she is “le pharmacien” and not “la pharmacienne” which, according to her and older usage, was the pharmacist’s wife. In October 2015, a quarter of a French opposition member of parliament’s sessional allowance was retained as a sanction because he insisted during a parliamentary debate on calling the female chairing the session “Madame le président” instead of “Madame la présidente”. Opposition caucus rallied to the defense of the member of parliament in question arguing that this “intolerable” sanction punished correct usage of the French language. Even the authoritative but conservative guardian of the purity of the French language, the Académie Française, came to the defense of the member, but to no avail. The sanction stood. More about the stance of the Académie Française in a minute. No doubt that any French-speaking person ran at least once into the tricky issue of feminisation of occupations, titles or functions or cringed at hearing a feminisation that sounded mocking or unusual. Feminisation of occupations in French is an old, complex, delicate, sensitive and vexing issue. There are two aspects to the problem: the evolution of feminisation of occupations and regional differences. Whereas we have achieved today relative gender equality in occupations, at least in what we would call the “developed world”, we used to emphasize gender differences as recently as in the 19th century and certainly much further back. There were female occupations and male occupations. Such male occupations or titles were “général”, “colonel”, “pharmacien”, “docteur”, “président”. While it was inconceivable back then that a “général” could be female, the “général” could be married. Therefore, the wife of the “général” became “Madame la Générale”, the wife of a “colonel” became “Madame la Colonelle” and so forth all the way down the ranks. The near equality that was achieved in modern times posed delicate language issues, especially in France. A large part of the younger female population, in part under the influence of the emerging feminist movement, insisted that their professions or titles should be gender specific , which meant that feminization thereof should be based of the occupation and not on their marital status. Therefore, “l’avocate” tended to refer to a female lawyer and no longer to the wife of a male lawyer, “la maîtresse” is a female teacher, “la députée” a female member of parliament. This momentum towards feminisation of occupation names should however be qualified: the academic world is still lagging behind: the masculine form “professeur”, “écrivain” are still preferred in France. Also, some names cannot be feminised because of a sexual connotation (people may chafe at “le sauteur en hauteur” becoming “la sauteuse en hauteur”) or because the occupation’s name has the word “homme” built in it: “homme-grenouille” for “frogman” or “barman” for bartender. A funny note about evolution: feminization of “directeur” into “directrice” is acceptable for some high ranking occupations but not for others. “Directrice” clearly suggests a school principal, but not a senior female civil-servant who is still addressed as “Madame le Directeur“. So, one may conceive a meeting between “Madame le Directeur” and “Madame la Directrice”. Quebec has been the most dynamic French-speaking jurisdiction in the feminization of names of occupations, titles and functions. As early as 1979, the “Office québécois de la langue française” recommended that a feminine equivalent be created for all names of occupations, titles and functions. Feminization first appeared in administrative texts, then in collective agreements, became the norm in publications and had now permeated in everyday language. Words such as “professeure”, “auteure” or “mairesse” have long existed along the banks of the St.Lawrence but the very conservative Académie Française repudiates them. In Belgium, feminization of names of occupations, titles and functions are governed by an executive order dating back to 1993. A guide produced for the general public, the “Guide de feminisation” was published in 1995 (http://www2.cfwb.be/franca/femini/feminin.htm). Now, the Académie Française…made of unelected and ageing officials who claim their right to dictate how francophones should write and speak. They remind me of the ultra-conservative Board of Trade that governs and amends (very slowly) laws governing soccer. The Académie Française stays put on its traditional position by being reluctant to approve almost any form of feminisation of titles or functions. In an opinion issued in 2002, it writes that “ the application or free interpretation of feminization “rules” declared often arbitrarily by certain French or francophone organizations has lead to a large number of barbarisms” and the systematic and impulsive selection of feminized forms creates […] inside the language a form of segregation that is inconsistent with the stated objective.” I wonder that that “stated objective” might have been. The controversy is unlikely to end anytime soon, particularly in France. This entry was posted in French Translations and tagged french feminisation of occupations on December 23, 2014 by admin. Simultaneous interpretation, which is also referred to as Conference interpretation, should be distinguished from Consecutive interpretation. In the latter, the interpreter facilitates a conversation between two persons who otherwise would not understand each other and intervenes during pauses. Conference interpretation is meant for larger groups and there are no pauses. The interpreter just has to follow the flow. For this reason, Simultaneous interpretation faces specific challenges. They must be addressed properly. Failing this, the conference, which organizers have taken great care in preparing, might derail and strip them of the return they were expecting. The challenges and requirements may be ranked in order of increasing difficulty: the equipment – the interpreters and degree of preparation – the degree of alertness of the interpreters – the word flow and last but not least, fatigue. The standard system, which is also the most common, is well suited for large conferences. It includes one or more booths of about 9’x4’ in size housing the interpreters, two headsets, two microphones fitted on a central console, infrared transmitters, headsets for the audience and a technician who installs the system before the conference, controls volume and sound balance during the conference and dismantles the system after the conference. The system can accommodate just two languages (for example, English into French and vice-versa) or an infinite number of languages if set on a more expensive relay mode. The portable system is the low cost option. Better suited to smaller groups, it fits into a backpack and does not require any setup. There is no booth, no infrared transmitters or technician. This low cost system allows for easy mobility from room to room (for example visiting a plant), but is taxing to the interpreters who are working without the benefit of a soundproof booth and therefore struggle sometimes to hear the speaker because of the effects of their own whispering in their hand-held microphones. Conference interpretation often tests one’s improvisation abilities in that clients rarely furnish adequate and timely preparation material. I would almost be at a loss to tell you how often I have been called upon to serve at conferences without having the slightest idea of what it was about apart from a vague hint provided by the conference title. Not only should conference interpreters feel comfortable in a wide variety of subjects (engineering, medical, administration, sustainable development), but improvise in the heart of the action. Unlike the translator who may pause to check a word in a dictionary, this option is unavailable to the conference interpreter. If the right word does not immediately come to mind, use a synonym. Unlike the consecutive interpreter, conference interpreters cannot ask the speaker to repeat. He or she is expected to go along now matter how fast the speaker speaks or else will fall behind and risk allowing an ever greater slice of the discourse to go untranslated. 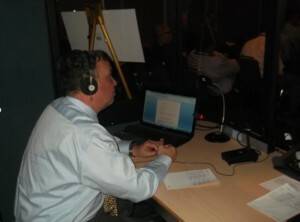 Philippe Vitu interpreting in a booth at a recent conference in Montreal. Conference interpreting has its challenges, but it is very gratifying indeed. Not all language providers are wired for it. The best compliment a client can address to me comes in the form of a question that I have often heard: “I wonder how you guys can do that”. Well, we just do it…. This entry was posted in Interpretation, Translation Service and tagged conference interpretation, interpretation, simultaneous interpretation on October 27, 2014 by admin. In these warm July days of soccer World Cup fever, it is fitting to wonder what about the purpose of those pre-games press conferences and how they are being translated for international audiences. These pre-games press conferences are imposed by the all-mighty FIFA to coaches and captains of teams whose games are planned for the next day. Surely, coaches could do without those mandatory press conferences and those exercises of answering questions posed by international media. This is not a place where coaches would sprinkle confidences about team line-ups and strategy. 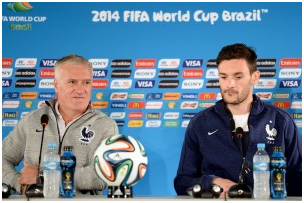 Instead, these imposed press conferences follow a marketing purpose: to display and promote FIFA sponsors. It all starts with the colorful three stripe football itself, property of mighty ADIDAS. Placed right in front of the coach himself , the useless ball pursues a pure marketing ploy…unless the coach and reporters present in the conference room decide to engage in an impromptu soccer game. Then, the blue background of questionable aesthetic value: logos off all other sponsors are there…a Japanese multinational company specialised in electronic music, a credit card company, a fast food company, a car manufacturer. Just as useless as the football are the energizing and high-sugar content beverages placed on the table with labels carefully turned toward the camera…I have yet to see a coach or player quenching his thirst with these healthy beverages…or see any glasses that organizers would care to provide. Business has its raison d’être that has nothing to do with logic. What about the interpreters? If you need English, switch to 1; Spanish, switch to 2; Portuguese, switch to 3 or French, then switch to 4. In this Babel tower that pre-games press conference have become, the interpreters are the indispensable tool for understanding personal football philosophies as explained by Joachim Löw, the German coach. We would have plenty of questions to ask to these interpreters if we were fortunate enough to meet them. These press conferences are graced with stereotype language. The French have an expression for this: “la langue de bois”. How do you render “langue de bois” into Korean or Farsi? Do you need to know soccer terminology before serving as a FIFA interpreter? Apparently not. At a press conference given by the Korean coach, Hong Myungbo, some technical word in Korean was translated in French as ” passe basse” or, litterally, “low pass” in English. I still wonder what it means. Remains that some incomprehensible translations have made these otherwise boring and self-serving pre-game press-conferences quite amusing. This entry was posted in Translation Service and tagged interpretations, pre-game press-conferences on July 4, 2014 by admin.